I keep drifting back to stare at this picture I took in September 2005 during my first trip to India. It was taken on the grounds of the Park Guesthouse in Pondicherry. The guesthouse is right on the Bay of Bengal and I woke up at dawn one day to do yoga outside, facing the rising sun. Surya namaskar on the Bay of Bengal at dawn is a good thing. 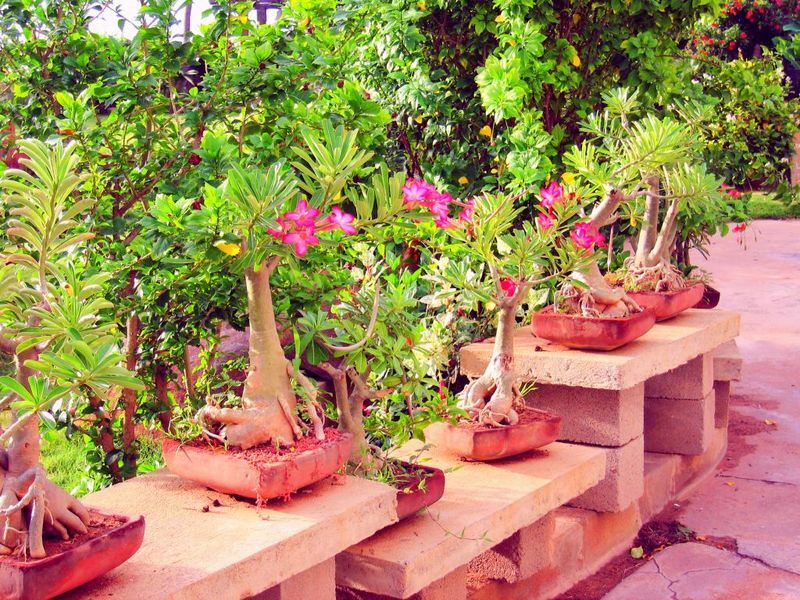 This is an amazing display of Bonsai Frangipani, which are trees in India. Looking at the thickness of the stems the plants must be quite old, and would surely be several feet high if growing normally. I tweaked the photo a bit to make the colors pop, but what you see is what you get in person. I will not visit Pondicherry on this trip, I’ve already been there twice, but that’s where I’m sending my yoga student when I hit the road. Next Post i rock! so there! those are so sweet!i might go to pondi if i can this trip. wonder how long a train is from kovalam.